Interactions/Mosaic prepares students for college classes by fully integrating every aspect of student life: from taking notes to talking with professors, and from analyzing textbooks to online homework. Modern Content: From social networking to gender issues, Interactions/Mosaic uses topics that are interesting and relevant to today’s students. Emphasis on Vocabulary: Each chapter teaches vocabulary intensively and in depth. This focus on learning new words is informed by more than 28 years of classroom testing. Online Homework and E-Book: Connect ESL is the next generation of online homework and resources for teachers and students. Project your E-book in class, assign all-new exercises for homework, and monitor your students’ progress with this easy-to-use online environment. 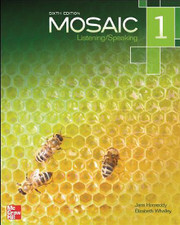 Interactions/Mosaic 6th edition is a modern course for the 21st century student. The series teaches the academic language students will need in class and the informal language they will need around campus. Relevant readings and listenings model the academic and non-academic texts students encounter in college, and intensive vocabulary development provides a solid base in everyday and academic words. Homework is completed online, providing even more practice and preparing students for university courses. Modern, relevant material keeps students engaged. Intensive vocabulary practice takes students through the most common words in English and the Academic Word List. A careful balance of academic and non-academic skills ensures that students are prepared for college classrooms and informal interactions around campus. Just as in university courses, homework is completed online, with a variety of automatically-graded exercises.